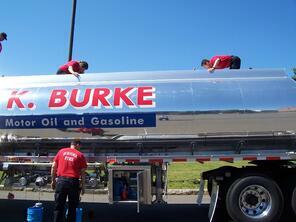 Matt Manoli, Dennis K Burke's Safety Director, hit the road again for more Firefighter Training on Tankers. The goal of the free training, which Matt has done at several Fire Departments throughout Massachusetts, is to provide firefighters an opportunity to familiarize themselves with the trucks and their shut offs and safety features in a non-emergency situation. Each of the firefighters has a chance to climb in and on the truck, turn on release valves, and learn about changes in safety technology.